Create a Backdrop – Plant a row of trees in the background. Placing tress behind flower beds or shrubs will provide a backdrop. One long-time cherished favorite includes the maple. Plant One as a Focal Point – There are dozens of trees that can stand alone as the centerpiece of a landscape area. For example, consider a flowering tree as a focal point. Additionally, consider the variation in color for fall. Trees can provide bright yellow and orange to wine red as autumn progresses for a beautiful view. Use Several to Define a Space – Trees are often used to delineate the border of a property, but they work equally well in defining a space within that perimeter. Use small trees with foliage that reaches to the ground to create a wall to block sight lines and noise from the rest of the yard. In addition, the fresh pine scent makes for a very relaxing environment. Welcome Guests – A homeowner doesn’t need a long driveway and acres of land to plant a welcoming row of trees. A line of red twig dogwoods, planted along the path to the front door shows guests the way to the entrance while also enlivening the front of the home. 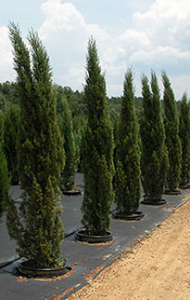 For more specific information on using trees in your backyard or on landscape design in general, please contact Hutcheson Horticultural Company.